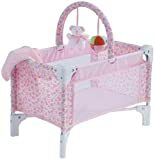 This doll bed features an adorable teddy-bear print fabric and comes complete with blanket and removable play arch with two soft toys. Fits dolls (not included) up to 14" tall. Little mommies will enjoy taking their favorite baby doll for a walk in this pretty pink and white stroller. Fits up to a 12" baby doll (not included). Handle height is 21" from the ground. Thanks to its cuddly soft, beanbag body, Calin Yang can be posed just like a real baby. Calin Yang wears a pink flowered blouse with bow, pink shorts and a matching headband in her black hair. Calin baby dolls can wear any fashion from the Mon Premier collection. Corolle also offers a wide selection of nursery accessories specially sized for Calin babies. Corolle Mon Premier Calin Yang Doll 12"
Calin Yang Pastel 12" . Les Calins are adorable baby dolls, with delicate vanilla scent, soft vinyl head and limbs, plus pellet-filled cloth body to allow full flexibility. Washable. Yang has black hair, dark brown eyes, and is dressed in cute pink outfit plus matching headband. Corolle offers a full range of additional outfits and accessories for Les Calin dolls for maximum play value. Calin Charming Pastel 12". Les Calins are adorable, washable baby dolls, with delicate vanilla scent, soft vinyl head and limbs, plus pellet-filled cloth body to allow full flexibility. Blue eyes open and close. Cute 1-pc pink and white knit outfit with matching hat. Corolle offers a full range of additional outfits and accessories for Les Calin dolls to maximize play value.